A Dentist Works to Keep Your Teeth Healthy for a Lifetime! Some people may only floss the very front of their smile or pay special attention while brushing to the visible teeth. This is fine…if you only plan on keeping your front teeth for the rest of your life. If you want to keep your whole natural smile for a full lifetime, you must care for all your teeth and gums. Your dentist is here to explain how important it is to care for your smile starting while you’re young. In the case that you have a sign or symptom of a dental problem, you must seek assistance from your dentist! Proper Care for Your Smile is Crucial! Brush your teeth at least twice a day for two minutes per session. Keep each of your regular dental appointments. Include vitamin-rich foods in your diet. By taking diligent care of your teeth at home and having your teeth professionally cleaned and checked, you have a much higher chance of maintaining great overall health and retaining your natural teeth. Visiting Your Dentist is Also Key! 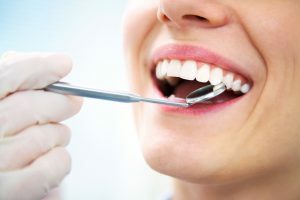 Excellent dental care is centered around preventing problems, but when an issue does arise, it’s important to know that you must see your dentist right away to save your natural teeth. No oral symptoms should ever be ignored—especially these ones! Dental pain of any kind—whether it’s moderate, severe, sharp, occasional, positional, or deep set—it’s not normal and should never be treated as such. Pain is an indefinite sign that something is wrong. Sensitivity is also a sign that there is something wrong with your oral health. If you feel pain every time you eat or drink hot or cold substances, reach out to your dentist. Swelling of any of the mouth is a red flag. Lumps, bumps, pimples, or unknown ridges could be a sign of infection. Abnormal bleeding—even a little—is never normal. Even when you’re brushing your teeth, you should never see blood. If you do it’s time to see a dentist so you can avoid gum disease or other dental problems. Discolored areas of the teeth could be a sign of tooth decay. Reddened areas of the mouth are signs of irritation or inflammation. Loss of feeling within the mouth can also be alarming. If this happens in any area of the mouth or face, it could be indicating nerve damage. Despite popular belief that dentists are scary, dental professionals are here to help you keep your teeth throughout your whole life. If you ever show any symptoms of dental problems, it’s important to reach out to a trained expert to help restore optimal oral health. Here at Ascot Aesthetic Implants & Dentistry, we know that preventive care plays a significant role in each patient’s oral health. That’s why we take it so seriously. If you ever have a question or concern, feel free to reach out to our office for sound advice or to schedule an appointment. Comments Off on A Dentist Works to Keep Your Teeth Healthy for a Lifetime!